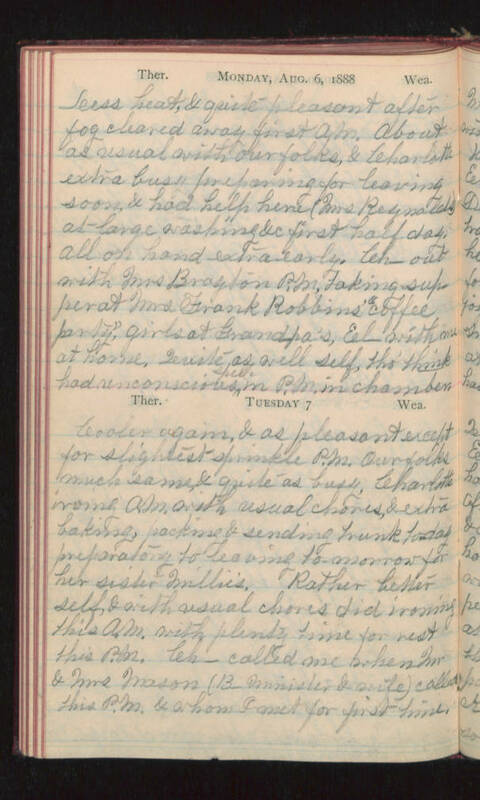 Monday, Aug 6, 1888 Less heat, & quite pleasant after fog cleared away first A.M. About as usual with our folks, & Charlotte extra busy preparing for leaving soon, & had help here (Mrs Reynolds) at large washing &c first half day. All on hand extra early. Ch- out with Mrs Brayton P.M. taking supper at Mrs Frank Robbins' "coffee party", girls at Grandpa's, El- with me at home. Quite as well self, tho' think had unconscious spell in P.M. in chamber. Tuesday 7 Cooler again, & as pleasant except for slightest sprinkle P.M. Our folks much same, & quite as busy. Charlotte ironing A.M. with usual chores, & extra baking, packing & sending trunk today preparatory to leaving tomorrow for her sister Millie's. Rather better self, & with usual chores did ironing this A.M. with plenty time for rest this P.M. Ch- called me when Mr & Mrs Mason (B- Minister & wife) called this P.M. & whom I met for first time.